The wraith-like remnants of the four leaders of New Londo Ruins who fell to dark after being tempted with the art of lifedrain. Defeating the Four Kings is necessary to the plot, and is also necessary for those players wishing to join the Darkwraith covenant. Those wishing to join the covenant must defeat the Four Kings before obtaining the Lordvessel from Anor Londo and talking to Kingseeker Frampt (talking to Kingseeker Frampt prior to obtaining the Lordvessel is permissible). In order to safely survive the Abyss while fighting the Four Kings, all players (host and any summons) must wear the Covenant of Artorias ring prior to entering the Abyss, and keep it on during the entire fight. Removing it at any point will result in death. It is not necessary to wear the ring after the Four Kings are defeated. This boss is located at the end of the New Londo Ruins in the Abyss. As the name suggests, this boss actually consists of four individual, seemingly identical wraiths, who appear one at a time out of the darkness of the Abyss to fight you. The appearance of each new wraith is timed, so it is important to defeat the current one before the next one appears. If you do, you will have a few moments before the next fight starts in which to heal yourself, reapply buffs, or change equipment. Failure to do so can result in having to fight more than one wraith at a time, which rarely ends well. As the Four Kings share an overall boss health bar, with sufficient summons assistance or overall damage output, it is possible to deal enough damage to the first three that the fourth King does not actually appear. 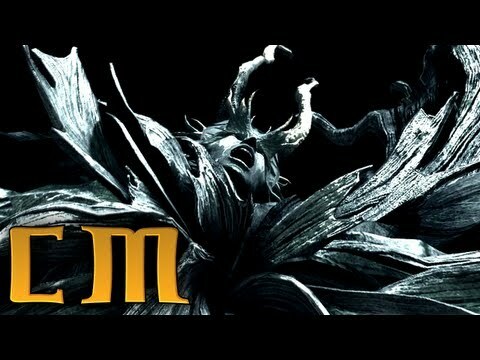 The Four Kings are generally considered the most dangerous boss in NG+ and beyond, and as discussed below many strategies have been developed to try to assist players on subsequent playthroughs. Each King is armed with a formidable sword, magic spells, and a dangerous grab attack. Given the nature of the attacks as discussed below, it is generally better for melee characters to get as close to the King as possible and continue strafing to one side, as this will cause the King to rely mostly on melee attacks in response, many of which will miss or do relatively little damage. Mage characters with low stamina or armor will want to either stay close and rely on dodging, or stay well away in order to employ spells better. The worst thing to do in any case is remain at a middle distance, as this will subject the player to the full array and impact of the King's formidable arsenal of attacks. The King's melee attacks with its sword inflict primarily magic damage. The farther away you are from the melee attack, the more damage you will take, so be sure to stay as close to the boss as possible when using melee weapons. Spells or buffs that reduce magic damage, such as Great Magic Barrier or Great Magic Shield are very helpful. His melee attacks generally consist of (1) a pair of horizontal slashes, which must be rolled through, tanked, or blocked, (2) a vertical slice which can be evaded by dodging to the side, or (3) a stab attack which can also be dodged by moving to the side. The King may fire off a large homing purple mass that slowly but surely glides to you from the side. This attack can be difficult to avoid once launched, so it is often better to stay at close range to lower the odds it is used in the first place. It can be avoided by running away. The attack will disappear after about 15 seconds. The King may also employ a rare spell attack in which it launches an array of missiles at you in an arc, which also home in on you. They usually do this when you are extremely far away from them. Dodging or blocking with a high magic resist shield can be effective. They may also employ an area of effect charge up explosion that causes significant magic damage in front of it. Rolling away is extremely effective. They also have a grab attack that deals massive magic damage and also steals one Humanity from you - they do a 360 degree spin prior to performing this attack, giving you the opportunity to back-up sufficiently. Don't confuse it for the Area of Effect, as it has a similar starting animation. Sometimes it is easier to roll behind them. The Abyss can be a confusing place to those entering it for the first time. By its nature there are few visual cues as to the direction the player is moving, and it is easy to get disoriented. The first King will not appear instantly, so it is important to continue rotating the camera, as the King may appear from any direction in the shapeless void. It will first appear at a distance, so try to spot it as quickly as you can. If you're not a mage, it's recommended to have good poise and just charge the first King to reduce the likelihood it starts using ranged spells. Continue strafing to one side as close to the King as possible, while repeatedly using your stronger melee attacks. It is generally better to attack rather than try to block, so two handed weapons often work better. Leave yourself just enough stamina to block or roll if you get into trouble, and make sure to top off your life bar whenever it drops below 50 percent. 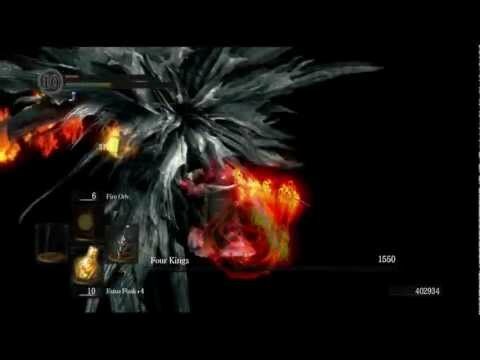 Having 15-20 Estus flasks and your Estus flask upgraded to +5 or higher can make a big difference. You may also have time to use Humanity items during the fight or if you kill each King before the next appears. Quickly try to defeat each King as soon as it spawns, because the constant spawning is on a timer and you can give yourself breathing room between each King if you kill them quickly. Mages may elect to tackle the Kings either at range or up close, but in either situation a good magic resistant shield and dodging ability is recommended. For NG+ as the kings have an extended amount of health, it can often be difficult for most players to defeat the first king before the appearance of the second, third and fourth kings. Staying within direct melee distance of the king will usually prevent any of the other kings from attacking you until the king you are focused on is dead, wether this is due to the fact that the kings can damage each other or if its just a bug we dont know. It is recommended that you wear a heavy armor (e.g Havel's, Golem, Giant +5 Etc.) and use a two handed weapon, spamming RB / R1 and healing when necessary. At close range the kings only use one attack (excluding the grab attack which is easily dodged) and fortunately the attack they do use is deals the lowest damage of all of their attacks. lower level characters may be unable to do this as the kings do deal a lot of damage overtime and their grab attack proves to be deadly. However a soul level of 170+ garuantees a victory. 100+ is also quite easy. To save on casts you should attempt to run through the level to the boss without fighting enemies. Starting from Firelink, go down the lift to the New Londo Ruins and make sure the water has been lowered. Right as you get off the last bridge before the first ghosts take a diagonal right and fall off the cliff to the floor below. You will see before you fall that down below is the shallow pool area up ahead from where you will drop. From your drop head towards the shallow pool area and then to the right exit from the pool. You will have to run past one darkwraith knight (or kill him with 1 CHSM to make the next part easier). From the right exit of the shallow pool look to the left and notice a small staircase leading up to an entrance of a bigger fortress structure. This is where it can get tricky. If you have the Grass Crest Shield or other stamina regeneration items it can be useful for this one part. From the bottom of the stairs you need to sprint through the entrance past the ghosts (that you won't see) and between two darkwraiths on the left and right of you, navigating and jump rolling through them to get to the exit on the LEFT side. While still running, dodge past the last ghost and quickly go through the fog wall where you are almost safe, ghosts can move almost entirely through the fog wall and have long range melee attacks that can hit you. Move down a the stairs a bit to get out of range. Don't forget to switch your rings! You should also switch your pyro and your catalyst to your main-hand and a good stable shield on your off hand. All in all, spam the kings fast and hard while protected and anticipate when your shield is going to run out so you can recast. You could even time the duration of the spell with the lingering dragon crest ring and use a stopwatch if you are efficient enough. Also try not to get grabbed by the kings because it lessens the amount of time you can spam your casts. It is also possible to run down to the entrance to the Abyss by way of the otherwise seldom used bonfire at the bottom of Darkroot Basin (closest to the Hydra, in a tunnel near a black knight with a halberd). Lowering the water causes it to drain out into Valley of the Drakes through the now opened doors. From that bonfire, head up the tunnel and take the lift down to Valley of the Drakes, and sprint through the assembled drakes across the bridge into the lower New Londo ruins. From there you may make your way to the Abyss tower relatively easily, and without dealing with many ghosts. If you have the greater magic shield spell you'll take little or no damage even from the Kings, particularly if using a powerful shield such as the Greatshield of Artorias. Other good options are the Crest Shield, or a Giant's Shield upgraded along the Magic upgrade path (which increases its magic block percentage). This is critical for caster type characters with little endurance and vitality. Working strategies include equipping the Lingering Dragoncrest Ring for longer duration of the Strong Magic Shield and spamming the Kings with Homing Crystal Soul Mass and as many other spells that you can fit. Homing Crystal Soulmass, Soul Spear (and crystal), Great Combustion, Great Chaos Fireball, Great Fireball, and any other spells you think might be good for DPS use them. Iron flesh is not recommended for mages because Great Magic Shield virtually cancels out every attack they throw at you (even the grab AND without your shield being up) and casting Iron Flesh will waste time and cut mobility which you may need when you need to back up and recast Great Magic Shield. For casters this boss is relatively easy, usually you can do enough damage to kill off the bosses before you have to worry about fighting multiple Kings at once. A shield is recommended, but you won't need any Magic Shield spells. Pick a shield with as high a magic reduction as you can find, the Crystal Ring Shield or the Crest Shield are good options. Learn to dodge all of the Kings slashing physical attacks, his two horizontal slash combo is the most dangerous since if you don't dodge the first one the second one will almost certainly hit you. For most casters that is enough to damage to kill you. The other physical attacks are a vertical slice and a stab attack, dodging side-to-side easily evades these. The King's magical attacks are extremely difficult or impossible to dodge, one is a slow moving homing purple thing that does large damage and the other is an AOE explosion. Those are the things that should be blocked with your shield, and even the 10%-15% damage that gets through might require you to use a flask as soon as possible. Do not ignore the slow moving purple spell, it will never stop chasing you so it is best to put your shield up and move toward it to get rid of it. When you see the King charge up for an AOE attack, get ready to block it. Blocking the physical attacks are a waste of stamina, especially if your a caster who hasn't invested many points in Endurance. After dodging BOTH the horizontal slashes or any of the other ones it is time to cast spell(s) or use a flask. Don't hold back your spells, and remember overkill on one King will affect the total Boss HP remaining so using your most powerful spells first is recommended. You shouldn't have much trouble killing the Kings before multiple ones spawn as they are not particularly resistance to magic. Note that you should stay far enough away from the boss to avoid his humanity draining grab attack, which should not be hard for spell casters. Equip armor that will leave you mobile and able to move quickly, and do not be afraid to charge one of the Four Kings. Get as close to him as you can, and start hacking away with whatever your most powerful weapon is, preferably with lighter, quick attack animation weapons, like swords, the hand ax, etc. Even if they hit you with their melee attack, there is a good chance that they will bash you with their hilt, which causes substantially less damage. By quickly attacking one at a time, you will limit the amount you will fight, as more are summoned throughout the fight. They appear to have some weakness to fire, like many undead, so a fire weapon may be a good choice. Using the Grass Crest Shield, Mask of the Child, and/or Cloranthy Ring will help with the fight. The extra stamina recovery ensures you can focus on attacking without worrying that you will be unable to preform a roll to escape. If you're confident about not getting hit by any physical damage, you can try using simple magic resistant cloth gear. Timing is the critical factor in determining whether you will survive. The sword slashes are easily dodged due to the slow attack animation, and due to the fact that even if you don't perfectly time the dodge, the height difference may cause them to miss the attack. The glowing sphere is dodged by moving away from the caster, running or a few quick rolls will suffice, because despite the large animation, the attack itself doesn't have huge range. The blasts encountered by the Four Kings is by far the more difficult attack to evade. Due to the darkness of the Abyss, it is difficult to roll through because your depth perception is thrown off. One way to help with this is to stop locking on, and focus on dodging the blast. As you see it coming, quickly run to the side of it and then roll very quickly. With some practice, you can evade the explosion of the attack just before it hits, and the attack will still explode. His grab attack is more damaging than his regular melee strikes, but shouldn't kill a well armored target. His grab isn't difficult to dodge, but during your first few fights, it may be difficult to tell what attack he may try using. The real key to this strategy is focusing on one King at a time. Individual wraiths can be brought down once they take enough damage, which obviously limits the difficulty and what other wraiths may be doing. For the most part, dealing enough damage quickly limits the amount of ghosts from two or three, and by the time you get the Four Kings of New Londo down to low health, you should be able to do a final combo of hits to bring him down. Limit your time not locked on, as its easy to lose the ghost you were fighting if you keep trying to evade everything. Focus on beating down one by one. Also don't panic about your back being turned to some of the Four Kings, just pivot your character and try to face the majority of them, then you can see what they are planning. This aggressive strategy revolves around using the Pyromancy Power Within. You can check out where to get it here. This Pyromancy will allow you to get a substantial buff to your damage (around 40%), at the cost of having your health constantly drained. If you have high Vitality this is an ideal strategy for your character. Take your Pyro Flame and cast Power Within as soon as you reach The Abyss. For the next 100 seconds you'll be under its effect so it is of crucial importance to make the most out of it, that's why it's recommended to take some Green Blossoms with you to help with Stamina recovery. The faster you recover your stamina, the more swiftly you can deal damage. Grass Crest Shield also helps serving this purpose. If you have it, you can equip it and then two-hand your weapon for extra damage while getting the Stamina recovery boost just by having the shield on your back. It's also advisable to stay under 50% equip burden. Do NOT worry about defending, blocking or rolling, just stay as close as you can to those kings and whack away no matter what they do. With your high vitality and while under the effects of Power Within if you stay close to them you won't have to worry about the damage, just heal when your hp is getting below 25%. Use your strongest weapon and make sure you're two-handing it. When you're not healing you're attacking. Stay aggressive at all times. The only move that's worth trying to dodge is the humanity grab, and only because of it's long animation time. Usually the King will do a 360 degree spin before going for the grab. Although friendly summons can be helpful in many boss fights, they are very useful against the Four Kings particularly if the summons and host are a mix of melee and caster characters. With such an arrangement, the King will typically focus on sword attacks on the melee character, who should be attacking at close range. This will then free up caster characters to stand off safely and rain spells down on the boss. If you are helping someone fight the Four Kings, an easy way is to equip full Havels, Havels ring (to stay <50% load), Grass Crest Shield, and your strongest weapon (two handed). As soon as the fight starts, charge each King and engage in an all out melee assault. If your health gets low, instead of relying on the host heals or using Heal Miracle, just use a Humanity. With this you will be able to focus on the King without getting interrupted, you shouldn't be getting that much damage, and if you do just heal yourself and keep doing it. Unless the host isn't attacking at all, you should be getting down the boss even before the next one spawns. The most common places for summoning signs for runs on the Four Kings are on the platforms near the Hollows at the base of the elevator leading down from Firelink Shrine into the New Londo Ruins, and near the Abyss fog gate. Summons should always remember to wear their Covenant of Artorias Ring before entering the Abyss. There are often complaints or reports of a "glitch" with NPC Beatrice not entering the Abyss or otherwise not targetting the Four Kings. This is not actually a glitch. When she is summoned, a ghost spawns ABOVE the tower to the Abyss. When you walk through the fog, the ghost will hover and Beatrice, who is NOT cursed and therefore unable to harm the ghost, will senselessly shoot at the ghost to no avail instead of following you. Just kill the ghost, jump down, and Beatrice can be a major help in the battle. Her magic is quite strong, and if nothing else can give you a breather as she can take quite a few hits. 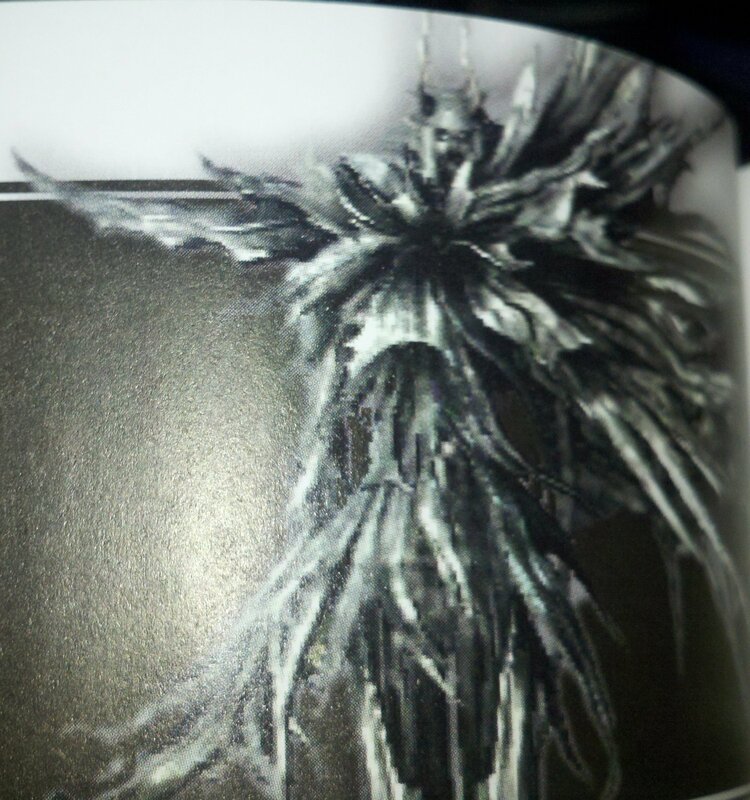 Also, if you use her in the battle and she lives, her catalyst and Witch robes will spawn in The Valley of the Drakes, between the entrance to Blighttown and the entrance to New Londo Ruins. In later playthroughs, she practically becomes useless, because the damage she inflicts will be extremely ineffective against them. That, and she dies a lot quicker from their melee attacks than in your first or second playthrough. New Game+ (and beyond). Of all the powered up bosses in NG+, it is generally held that the Four Kings are the deadliest. Even with high poise and high defense armor, their attacks whittle away at your vitality quickly and they have significantly increased health which can throw off timing and make it difficult to kill one before another appears. Additional tactics in NG+ include equipping either Havel's or Smough's set of armor and having either 2 attunement slots dedicated to Great Magic Barrier or 1 to Great Magic Barrier and 1 to normal Magic Barrier if you don't have 2, or the faith requirement. Equip the most powerful 2 handed weapon in your arsenal and enter the Abyss (a shield with high Magic defense and the Cloranthy ring are also recommended). Upon arrival, cast Great Magic Barrier either when the first King spawns or when you've dispatched him. When it runs out, be sure to recast, not matter if you're taking hits from the swords or not, as the magic that the Four Kings cast is much deadlier than their blades. Heavy Combustion is also recommended for dealing damage along with your weapon of choice. This strategy, along with proper estus application (should have at least 10) is a viable solution for melee builds and only has limited faith requirements. If by any chance you have not killed one of the Kings and another one (or 2-3 more appear), the fight becomes much harder in the process, as they will each start attacking you one by one. The easiest strategy for Melee fighters is to lock onto one of the Kings that you were fighting earlier and just run around that one King and occasionally swipe at that one King. Doing so will make the attacks of the other King(s) less accurate and will miss you entirely. Do not remove the Covenant of Artorias Ring during the fight. Doing so will cause you to fall through the floor and die. This gives the message "The Abyss has taken you." However, once you have defeated the Four Kings, you no longer need to wear the ring in order to walk around the Abyss. You must still wear the Ring of Artorias if you have defeated the Four Kings and are summoned to help someone against the Four Kings. Since they have not beaten the Four Kings in their world, their Abyss will still take you, whether you have beaten the Four Kings or not. To become a Darkwraith, you do need to kill the Four Kings before you get the lordvessel in Anor Londo and talk to Kingseeker Frampht in Firelink Shrine. (You could still do it after the lordvessel, but you can't talk to Kingseeker Frampt at all after you get it. You can talk to him all you want before you get the lordvessel.) At higher levels, the Four Kings may be defeated normally as discussed above. Some players, however, may wish to defeat the Four Kings as soon as possible in order to join the covenant. For a low level melee character with a reasonably damaging weapon, an effective approach is to increase your attunement to 10, obtain the Iron Flesh pyromancy, and equip the heaviest armor you have. The strategy is simple: apply Iron Flesh, approach the Kings and strafe as close as you can, and just aggressively attack with a two-handed weapon. Both the zweihander and the claymore are easy to obtain and upgrade early in the game, as is the gravelord sword. When you are very close to the kings almost all of their attacks do very little damage (accept for the huge purple explosion, so watch out for his charge up). Make sure you have upgraded your estus flask to at least +2 or +3 so you can fully heal in one go, and stay as close to them as possible. Low level mage characters, particularly those with little vitality or stamina, should expect to need the assistance of player summons and/or Witch Beatrice. Obtaining the Magic Shield spell from Griggs can help, and a mage may be able to do some damage with the various soul arrow spells at range. However it is generally easier to rely on summons, while playing defensively and acting as a healing station via Estus flasks. You may wish to first return to the Asylum to obtain the Crest Shield for its high magic resistance, and possibly upgrade it with Twinkling Titanite obtained by trading with Snuggly during the same trip. You can also simply switch over to melee combat for the purposes of the fight, by two-handing the claymore (strength requirement of 16, which should be useable in two hands by even most mage characters), and possibly using more powerful pyromancy attacks or buffs - all of which lack any stat requirements. Iron Flesh combined with Great Combustion can be effective. Killing Lautrec very early on can help by allowing for use of the Ring of Favor and Protection with its attendant hitpoint and stamina bonuses, and also ensure that Firelink Shrine stays lit so you can bring 10 Estus flasks with you. Doing a quick run into the Catacombs to kill Pinwheel and get the Rite of Kindling can push that up to 20 flasks, which should be more than sufficient even at low levels. Note: if you are trying to upgrade your Estus flask, picking up the Firekeeper Souls in the Parish, Blighttown, and New Londo Ruins will cause Lautrec to kill the Firelink Shrine firekeeper even if you haven't rescued him, talked to him, or even beaten the Gargoyles. So if you want to keep Firelink lit for the purposes of New Londo Ruins trips, kill Lautrec before picking upall three of those Firekeeper souls. Despite being called the 'Four Kings', more than four bosses may spawn if you take too long. You do not have to kill all of them, however; as soon as the boss' main health bar reaches zero, the fight will end regardless of how many kings you've defeated or how many have spawned.